I've eaten at Penny Cluse Café, the wildly popular early morning eatery on Burlington's Cherry Street, countless times. I'm in good company — yesterday morning, Vice President Joe Biden stopped by to try the blueberry pancakes. But until this week, I'd never had a chance to visit sister business Lucky Next Door. When I did, there were so many things I wanted to sample that it was hard to narrow it down. Since tacos ($4) are a specialty, and the spelt tortillas are homemade, I got one filled with caramelized onions, peppers and crumbly, Mexican-style chorizo. A side of avocado salsa ($2), plus splashes of (free) housemade tomatillo sauce, made for a hearty and flavorful main course. After trying some of the snack-sized, just-a-few-buck tacos at other spots around the state, I was surprised by this one's heft. Solo, it could have counted as a light meal. But I still had a few dollars left in my Dining on a Dime budget. 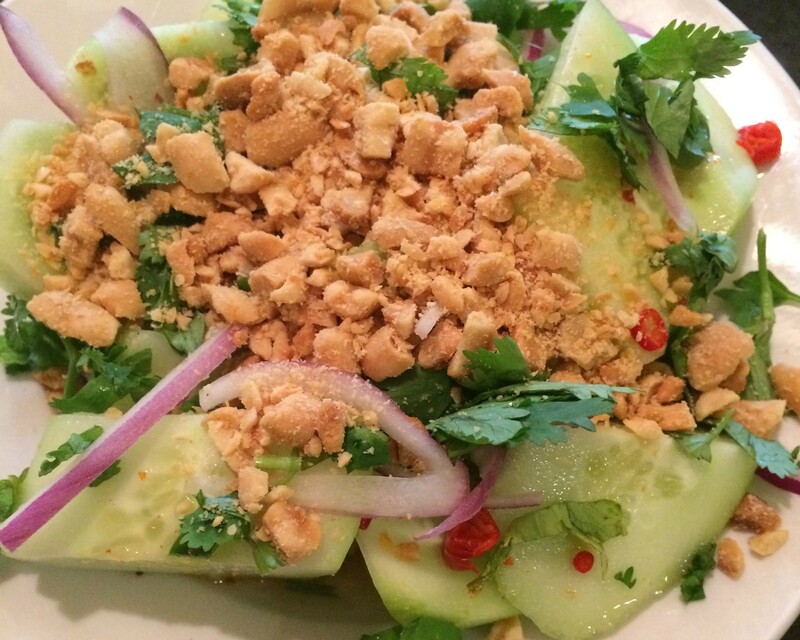 So, I ordered a cucumber salad ($5), which came with cilantro, red onion, chile and, most importantly, fish sauce. The refreshing cucumbers, a topping of crunchy peanuts and the saline funk of the sauce were a perfect finish after the taco. I can't ever get enough fish sauce, so I was happy that the condiment bar had a bottle for customers to use. I dashed a little more over the top of the cucumbers. And when I finished scooping them up with my chopsticks, I have to confess, I drank the liquid left in the bottom of the bowl. I'm a firm believer in licking my fingers when the mood strikes, but, in retrospect, I feel lucky that no important politicians were there to see me with fish sauce dripping down my chin. Not that it would have stopped me.